When Jim Connelly established the firm in 1996, he wanted a unique name that would allow him to build a distinct brand. After considering dozens of possible names, he opted for "Cedarock." It's concise, different, stimulates the nature-loving senses that most of us have, and is easy to remember. Best of all, "Cedarock" reminds Jim of a favorite place every time he says the name. It reminds him of far northern Door County, Wisconsin — specifically, Newport State Park. 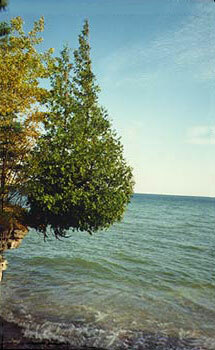 The Park is filled with towering, sweet-smelling cedar trees, many of which are firmly rooted in the rocky bluff of the Lake Michigan shore that was formed by years of evolution. Walks through the cedar forest are miles away from noise, distractions, and civilization. When there, you are surrounded by independent, confident, determined, self-supporting life. It's the perfect place for a creative soul to find itself, and be reinvigorated.